Seek for a feature-rich freeware to free download YouTube video movie and also convert YouTube to MP3 at one stroke? Here the all-conquering 5KPlayer addresses your needs to allow you download any online YouTube video, irrespective of YouTube in MP4, AVI, MKV, FLV, 1080P, 4k UHD to to MP3 music so as to playback on iTunes, iPhone, iPad, Android devices, set as ringtone or something alike. 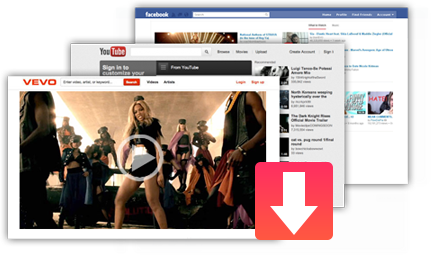 You need the best 2-in-1 5KPlayer, free YouTube offline downloader & converter, to directly download any online YouTube video movie to MP3 music at one go without costing any dime. YouTube provides us with numerous video resources for entertainment, majority of which can be downloaded free from YouTube with tons of free YouTube downloader & plug-ins. That being said, there is seemingly hard to find one featuring video free downloading, converting and playing into one. The good news is that the media player new king called 5KPlayer just fits the bill. As the uprising media player to change video format, 5KPlayer has almost all the bells and whistles that you expect to find in a media player with a perfect performance in downloading any YouTube video to MP3, like downloading Beyonce Crazy in Love to MP3 audio only, Taylor Swift Shake it Off to MP3 music, Sam Smith Stay with Me to MP3, Disney Big Hero 6 movie soundtracks to MP3 audio, etc. within seconds. Plus, it's also a sure winner in playing the downloaded YouTube MP3 files, as well as an array of video formats (MP4, MOV, AVI, MKV, 4K, 5K etc.) with fabulous stability. How to Free Download YouTube Videos to MP3 with 5KPlayer? Prior to call YouTube video to MP3 download task begin, you should free download this highly versatile YouTube MP3 downloader at the first place. Step 1: 5KPlayer setup completes in only 50 seconds. Launch 5KPlayer on your computer (for Windows users, you are required to double click to install this YouTube to MP3 downloader, For Mac users, just drag it to Application folder). Click "YouTube" icon on the main UI to enter the YouTube download window. Step 2: Copy the URL of YouTube video you wanna download and paste it to the box frame. Then this YouTube to MP3 video downloader will automatically detect the YouTube details for you. Step 3: Click the "Gear" shape icon to check the output format of YouTube downloading. Then choose HD audio (large size) or SD audio (small size). Tips: Click "Show all", you can find more resolution or format of the YouTube video for you to download. Also, there's an option to download subtitle with YouTube video or MP3 music. Step 4: Press "Download" button to download YouTube now. How to Free Convert YouTube Videos Offline to MP3 with 5KPlayer? Besides download YouTube video to MP3 directly, you are allowed to convert YouTube videos that you've already downloaded to MP3 with 5KPlayer. Step 1: Install 5KPlayer on Windows or Mac computer, launch it. Go to "Library" section of 5KPlayer. Step 2: Click the downloaded YouTube video that you want to convert to MP3, you will find there are two options for your YouTube video. Just click "Convert to MP3" and then this YouTube to MP3 converter will aid you to convert YouTube video to MP3 within seconds. In addition to free download YouTube to MP3 music, this impressive YouTube downloader differentiates itself from the rest of the competition thanks to its incomparable feature of downloading online videos music from Dailymotion, Facebook, Vimeo, over 300 video sites to MP3/AAC audio. With 5KPlayer in hand, you are able to download any video from any of video sites, irrespective of downloading 4K UHD video from YouTube, downloading 1080P HD video from Facebook or MP4 video downloading from Instagram, etc. Here offers you 10 ways to convert URL to MP3 audio online and offline, download and convert YouTube video URL to MP3. What is the best YouTube song downloader that could help me downloading MP3 songs from YouTube with high quality? 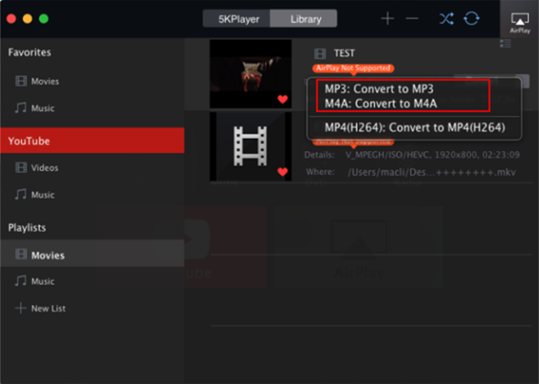 This page helps you losslessly convert MOV to MP3 Windows 10 or Mac, as well as convert MOV to AAC quick on the draw.